This Nicky’s Sixx is one for the books! 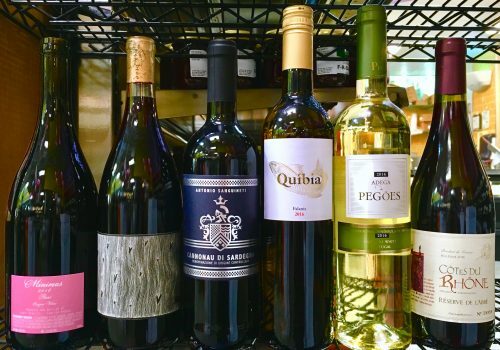 Check out our curated selection of featured wines, perfect for any occasion you find yourself in this season. Visit our Wine & Beer Department to find these and other distinguished wines. Minimus Wines “Illegal” Rosé (Tempranillo, Chenin Blanc, Pinot Gris, Petite Arvine, Schioppettino, Savagnin, Arbouriou), Willamette Valley, Oregon 2016 – One of the craziest and most delicious rosé wines we’ve ever tasted, made from a head-spinning panoply of grapes. Funky, fresh, hazy, and pyschedelic. Broc Cellars “Love Red” (Carignan, Syrah, Valdiguie), North Coast, California, 2016 – A bright, vivacious, and food-friendly red from Broc Cellars, one of the most forward thinking California producers of the recent new wave. Great for summer grilling. Falanis “Quibia” (Premsal, Callet), Mallorca, Spain, 2016 – A classic seafood wine from a paradise island. Savory and rich, with a molten texture and briny, oceany highlights. Antonio Sanguineti Cannonau di Sardegna, Sardinia, Italy, 2015 – Antonio Sanguineti can be found one of two places; working in the winery, or driving expensive cars at unwise speeds. This is a beautiful Sardinian Grenache, soft and delicate but with a smoky backbone. Reserve de l’Abbe Cotes du Rhone (Grenache, Syrah, Mourvedre), Rhone Valley, France, 2016 – A classic everyday drinker, and an epitome of the vibrant and medium-bodied style that we reach for frequently. Adega de Pegoes Branco (Field Blend), Setubal, Portugal, 2016 – Rich, juicy, and fruity, with a floral complexity typical of Portuguese white wines. An excellent pairing for spicy and exotically-flavored foods.